Bob Dylan | Me fail? I fly! 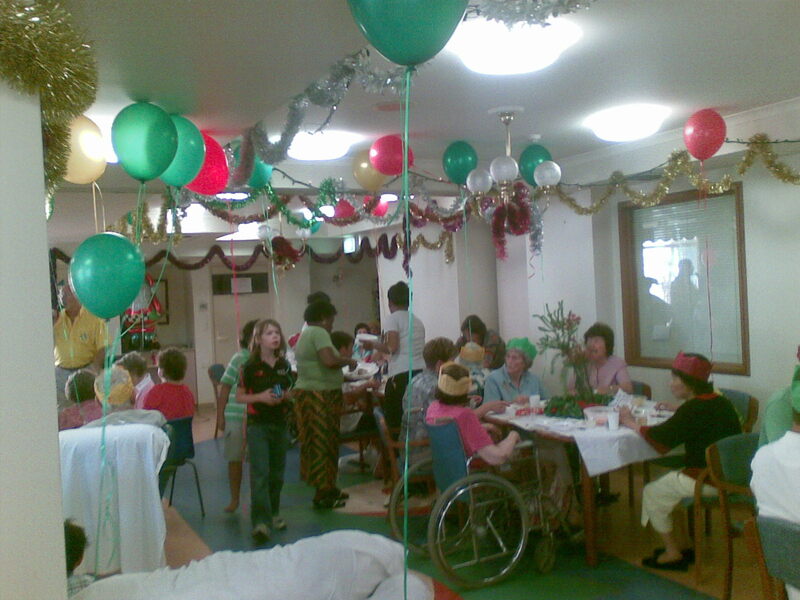 The nursing home, which is run by a church organisation, has a number of celebratory events at this time of year. Last Tuesday was carols evening, attended by residents from all the organisation’s nursing homes in the region. The home’s vast garage is hung with tinsel; there’s a gigantic throne for when Santa makes an appearance, and a number of life-sized Santa statues. A troupe of school children sing carols (some of the same ones that have been piped in from a CD player as the masses assemble. A chaplain (or ‘Director of Pastoral Services’) gives a brief talk about ‘the true meaning of Christmas’, which apparently is that her allocated time is far too short. There’s ice cream and cupcakes and softdrink. Mollie joined in the applause and waved her cup of lemonade in time to the singing, and that makes the event a success. Personally I’d rather have teeth pulled, or even listen to Bob Dylan’s latest album. On the weekend it was the residents’ Christmas party: more softdrinks and carols, though this time sung by a crooner with a finely developed sense of his audience, and mingled with other less single-minded tunes. There were lots of visiting relatives, including young ones, and a genuinely convivial mood. The dining room was cheerfully alive. And yesterday morning Penny decided we should experiment with taking Mollie out. She’s been pretty much living a wheelchair for a couple of months now, which has its own disadvantages, but paradoxically creates opportunities for greater mobility. When Mollie used a walker, her progress was so painful that to walk any further than the small outside garden would have been an ordeal. Yesterday, we dared to wheel her out – through the front doors into the astonishingly bright sunlight, down the short street with its occasional rose pushing through a cast-iron fence, across Balmain Road, and to the ultra-cool DiVi Cafe, where Mollie drank a cup of not-too-hot hot chocolate and watched a number of small children playing on playground equipment. She smiled and nodded (language has pretty much deserted her) and I realised that the simple, basic pleasure of being around small children is something that nursing-home residents have very little of. Those couple of minutes sitting in the sun, feeling the light breeze, sipping a lukewarm milky drink and watching a little girl play on a slide and a little boy try to give his father a fright had an awful lot of joy in them. I’m having a lovely time these days listening sporadically to Bob Dylan’s Themetime Radio Hour. He plays a marvellous range of music, from the full version of ‘You Are My Sunshine’ to totally esoteric blues, with lots of banjo in between, and gives good gravel-voiced DJ spiel, full of biographical snippets about the singers and songwriters he features. But just now, listening to the program ‘Musical Map‘, I had the uneasy feeling that there was some clay in his cowboy boots. He played a song by one Hank Snow, which he described as Hank Snow’s signature song. It was ‘I’ve been everywhere, man’, a charming patter song consisting mainly of a string of US place names. No mention of a writer, just the fascinating information that Hank Snow was the man who introduced Elvis Presley’s first stint at the Old Oprey. Bob, just in case you’re reading this, the writer of that song could have done with a mention. He was Geoff Mack. And before it was Hank Snow’s signature song, it made Lucky Starr a household name in his home country. But both of them were Australians. Not worth a moment’s notice. Apparently. Hmph!